Add character to your entryway, door, bedroom, bathroom, patio, cabin or garden with our metal wall rack. Made from iron and decorated with a vintage, antique-like finish, these wall hooks will the best home décor. The horses' design adds character to your home, while the rustic finish reminds us of an old-country charm. Get one today for yourself or to your friends to make your home a better place. 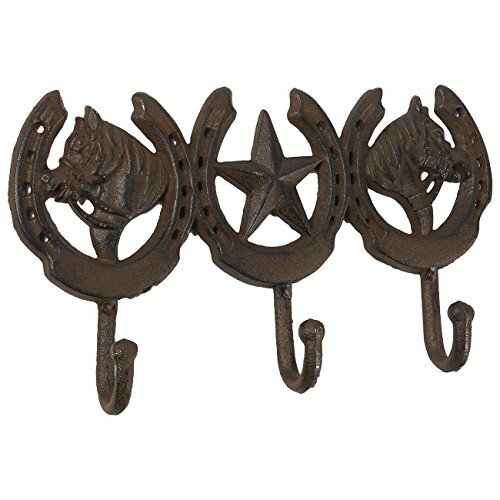 DESIGN HOOK: Metal horses design wall rack with 4 hooks hangs various items, adding character to your entryway, door, bedroom, bathroom, patio, cabin or garden. DURABLE: Solid Iron construction for durability and functionality, an attractive way to make your entryway, hallway or door look very charming. EASY TO INSTALL: Pre-drilled holes allow you to mount it on the wall easily. Screws are not included. HORSES LOVERS: Perfect to give as a gift to horses lover friend or family member.